About 300 people community and faith leaders gathered at The Oblate School of Theology on April 3, 2017 for a conversation about San Antonio’s new Faith-Based Community Initiative, designed to strengthen the relationships between the city, area faith-based communities and nonprofits. The meeting, titled In the City for Good, was convened by Pastor Ann Helmke, who was chosen to lead the initiative by the San Antonio Department of Human Services. San Antonio city council members recommended creating the Faith-Based Community Initiative after immigration officials unexpectedly released 500 women and children in San Antonio in December 2016. 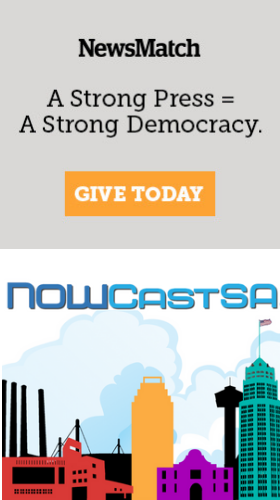 (See NOWCastSA’s story and video of that below. The Mennonite Church, Travis Park United Methodist Church and Casa RAICES (Refugee and Immigrant Center for Education and Legal Services) aided in sheltering the refugees. Helmke said better connectivity between faith-based communities and the city could help more people in need. “How can we finally get a communication system together that helps us on a daily basis to do our work...but also kind of an emergency broadcast system, so that when 400 immigrants show up, or we know they are coming tomorrow…to be able to put out that kind of emergency broadcast?” Helmke asked the group. For its inaugural year, San Antonio’s Faith-Based Initiative goals include developing relationships, creating a network, facilitating a common vision and building a capacity. It was not by accident that the convening was held at the Whitley Center of the Oblate School of Theology. “We build relationships based on our common experience of the God we understand to be essentially relational, modeling for us how to be together regardless of religious tradition, culture, race or nationality,” said Scott Woodward, Dean of the Oblate School of Theology. Texas Public Radio’s Bill Mitchell highlighted Dare to Listen, a campaign founded by TPR and the San Antonio Area Foundation. “Dare to Listen is a community initiative designed to encourage people to consider, to think, to explore, question, to appreciate differences...to reach across the fence, to build bridges,” said Mitchell. Kiran Bains, the city’s Diversity and Inclusion Office, said better connecting faith-based communities and the city has community-wide benefits. Organizing events like the Iftar dinner could help, Bains said. “I think that we could do that for our most vulnerable populations in San Antonio and really make public statements about love,” she said. Retired University of Texas Health Science Center Neonatology Pediatrician Rajam Ramamurthy M.D. said children are a vital part of San Antonio’s future, and teaching them to be peaceful is key to a better generation. “I think through this initiative if we can create some collaborations where we give the adults, the teacher, the pastor, the parents, tools to bring up the children for the next generation of peace,” said Ramamurthy. The next conference will be on the morning of May 25 and will focus on creating a resilient community and building a capacity. **Cover image San Antonio artwork provided courtesy of artist Christopher Moroney.